Five months has passed since the reconstruction of the community center/complex of Vurgavan Village in Qashatagh Region. The complex was built in the summer of 2015 by Hayrenaser Organization and consists of school with a gym, a health clinic, and a community administration center. Vurgavan was liberated during the Artsakh war and named after the liberation-fighter Vurg Voskanyan. Although, the process of resettlement began back in 1994-1995, the school had remained in a desolate condition and a hazard to student health up until 2015. Moreover, the town also lacked a health clinic and an administration center. The grand opening of the infrastructure complex took place on September 5, 2015. According to the town mayor, Gueorgui Khachatryan, these infrastructures gave new hope and faith to the villagers. “I am currently at the town center,” the mayor added during our interview. “More people attend our meetings to discuss issues concerning our village now,” emphasized the mayor. Before the construction of the administration center, town affairs were discussed in the streets or at the mayor’s house, depending on the weather conditions of the day. On the other hand, the reconstruction of the school has risen even more excitement. According to the mayor, parents are now more involved in their children’s education and want to learn about their progress. “There is faith in our village now. If parents wanted their children to leave the village before, they don’t think about it anymore,” added mayor Khachatryan. It has become more convenient to work in a school with better conditions, according to the school principle, Mkrtich Potoyan. “The condition of the building, the equipment and technology, all contribute to a better learning process. The teachers and students, both, have developed a new sense of responsibility towards the school. There is more organization and everyone is dedicated in completing their tasks on time and they take their work more seriously,” added Potoyan. The students also enjoy the new playground during recess. “We have received new desks, chairs, blackboards, and coat hangers for all the classrooms. There are no more disruptions during lessons since classrooms are kept orderly and clean,” added the principle. Hayrenaser presented the story of Vurgavan to another organization in the diaspora, and they agreed to fund the school with all new equipment. 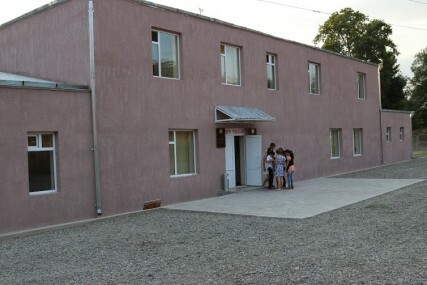 The principle also informed that the school is heated by a central heating system which was sponsored by Ara Haroutyunyan, the Prime Minister of the Republic of Artsakh. The prime minister and the founders of Hayrenaser, Stepan Sargsyan and Nelli Martirosyan, agreed that the heating project would be financed by the government of Artsakh. The price Armenian fighters paid to liberate these lands is priceless. Thus, it is our duty to do everything possible to develop and grow them. Vurgavan has faith today, a faith for a better tomorrow.